These are the actual Steaks being cooked by Josh on brand new Gas Grill. Note Hobo Pouches in back provide extra Smoky flavor. Metal Wood Chip box isn’t doing much. She put me in touch with her husband, who we will call Josh, by email. He informed me that he planned to invite “a few friends” over after our Lesson, to try out his food from the new Grill. No Pressure. We agreed that he would get most of the meats in advance, so we could do an abbreviated shopping trip before getting started. We did Recipes for Grilled Vegetables, Shrimp, Steak and Chicken Breasts. In this next part, here is the Grilled Steak Recipe. 1. Josh had supplied fresh New York Strip and Ribeye Steaks that were 3-4” inches thick. 2. Marinate Steak evenly in wet mixture of Olive Oil, Fresh Chopped Garlic, Parsley and/or Rosemary to taste. Add a generous amount of BBQ Dry Rub (click for Recipe). May also add Worcestershire Sauce to taste. 4. Sear Steaks on Medium to Medium High part of Grill, for 2–3 Minutes per side. 5. 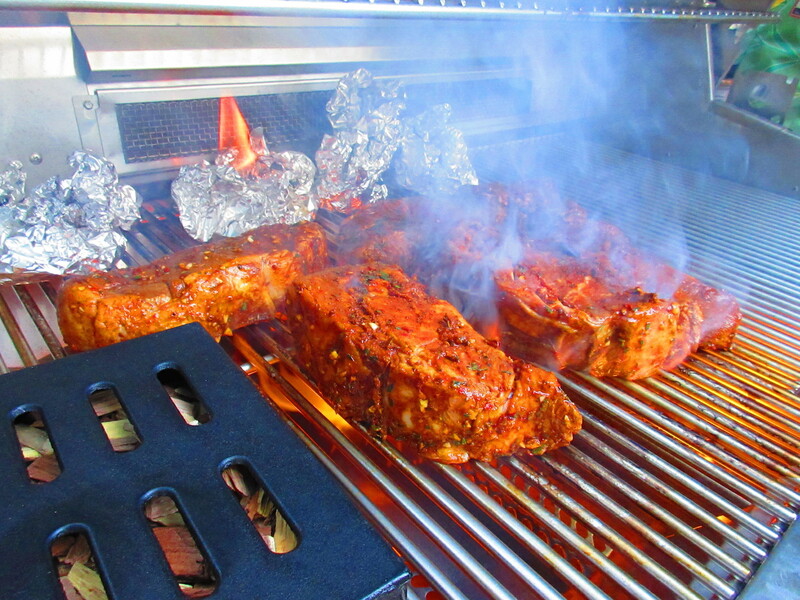 Once Seared, move all Steaks the Unheated part or Grill and allow to remain in Smoke for 40 Minutes to 1 Hour. Check with Instant Read Thermometer for Rare to Medium. If too Rare, you may cook again on each side oh hot part of Grill. Allow to rest for at least 5 minutes. 6. For serving, slice Steak into Thin Slices create Rare, Medium Rare and Medium sections on Serving Platter. Pour over Au Jus, or serve on the side with BBQ Sauce. Enjoy. Also look for Recipes for Grilled Veggies, Shrimp and Chicken Breasts from this Session.